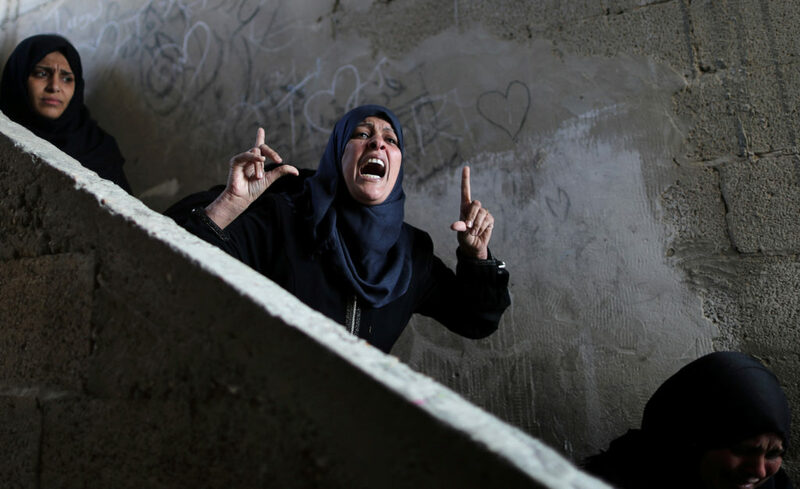 GAZA CITY, Gaza Strip (AP) — Chanting “revenge” and flanked by masked gunmen in camouflage, thousands of mourners in the Gaza Strip on Monday buried seven Palestinian militants killed in an Israeli incursion as the ruling Hamas group launched a feverish security sweep across the territory. Hamas said Israeli undercover forces entered the territory in a civilian vehicle late Sunday and exchanged fire with Hamas gunmen. The clashes killed an Israeli lieutenant colonel and prompted Israeli airstrikes and a salvo of rocket fire from Gaza toward Israel. The cross-border fighting came just days after Israel and Hamas reached indirect understandings, backed by Qatar and Egypt, to allow cash and fuel into Gaza. The understandings are meant to be part of a broader effort to alleviate deteriorating conditions in the impoverished territory after 11 years of an Israeli-Egyptian blockade. It was not clear if the burst of violence, which appeared to have subsided early Monday, would derail those arrangements. The overnight violence came after several months of confrontations along the Israel-Gaza perimeter fence. Israeli Prime Minister Benjamin Netanyahu cut short a visit to Paris because of the flare-up, and he returned to Israel on Monday for consultations with top security officials. Hamas authorities beefed up security measures after the incident, deploying checkpoints across Gaza in a show of force after what appeared to be a major security breach for the militant group. It also restricted movement through crossings with Israel, preventing foreign journalists, local businessmen and some aid workers from leaving the territory. 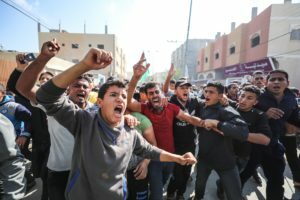 The Hamas military wing, Izzedine al-Qassam, said that in Sunday’s incursion, Israeli undercover forces drove about 3 kilometers (2 miles) into southeastern Gaza and shot and killed Nour el-Deen Baraka, a mid-level commander in charge of a sensitive area in the southern Gaza Strip town of Khan Younis. Qassam members discovered the car and chased it, prompting Israeli airstrikes that killed several people, the group said. The empty vehicle apparently used by the Israeli force was reduced to a charred chassis after aircraft fired several missiles at it, leaving a gaping crater in the ground. The Israeli military said there had been an exchange of fire during an operation in Gaza, with troops withdrawing from the territory with the help of aircraft. It said that militants then launched 17 rockets from Gaza toward Israeli communities, where school and train service was cancelled in response, and that it had reinforced troops and its aerial defense system along the border following the flare-up. The military provided few details about the reason for the raid. The Israeli military chief, Lt. Gen. Gadi Eisenkot, said a “special force” carried out “a very meaningful operation to Israel’s security,” without elaborating. Netanyahu returned to Israel on Monday morning, cutting short a trip to Paris where he was set to meet French President Emmanuel Macron after having participated in ceremonies marking 100 years since the end of World War I. A border blockade has led to over 50 percent unemployment and chronic power outages, and prevents the vast majority of Gazans from traveling. In a tweet after his arrival back home, Netanyahu praised the slain officer, whose identity was being kept confidential for security reasons, and said “our forces acted courageously.” The officer’s funeral was being held Monday. The overnight violence came after several months of confrontations along the Israel-Gaza perimeter fence. Since late March, Hamas has been leading mass marches, with turnout driven by growing despair in Gaza, to try to break the border blockade. The blockade has led to over 50 percent unemployment and chronic power outages, and prevents the vast majority of Gazans from traveling. More than 170 demonstrators, most unarmed, have been killed by Israeli army fire in the confrontations, in which some of the participants threw stones, burned tires or hurled grenades toward Israeli forces. Israel says it is defending its border against militant infiltrations, but its army has come under international criticism because of the large number of unarmed protesters who have been shot. Last week, Israel allowed Qatar to deliver $15 million in aid to Gaza’s cash-strapped Hamas rulers. Hamas responded by lowering the intensity of the border protest last Friday. On Sunday, Netanyahu defended his decision to allow through the Qatari cash to Gaza as a way to avert an “unnecessary war,” maintain quiet for residents of southern Israel and prevent a humanitarian catastrophe in the impoverished Gaza Strip.